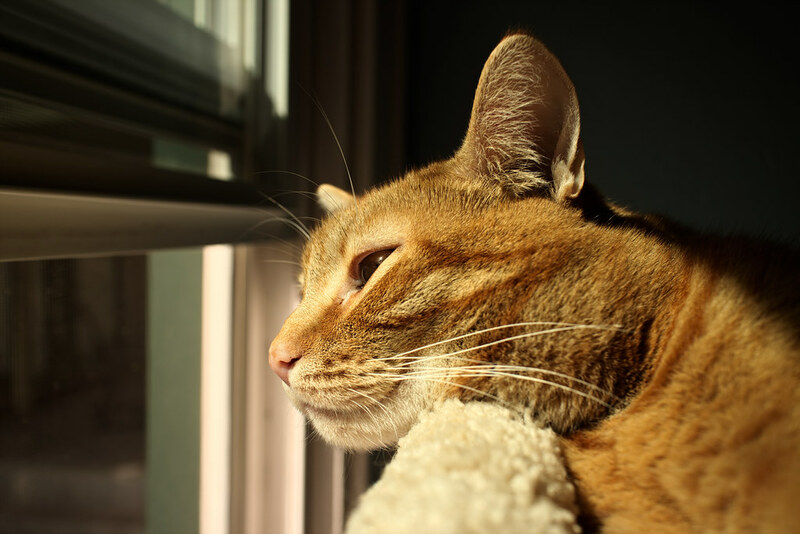 A break in the heat allowed us to open the windows during the day, so Sam took advantage to climb to the top of the cat tree to enjoy both fresh air and sunshine. The route Ellie and I take on our walk through Irving Park is lined with old oak trees, so in the fall we are surrounded by ripened acorns that have fallen to the ground. They smell enough like food to Ellie that she wants to sniff them, but not enough like food to try to eat them. 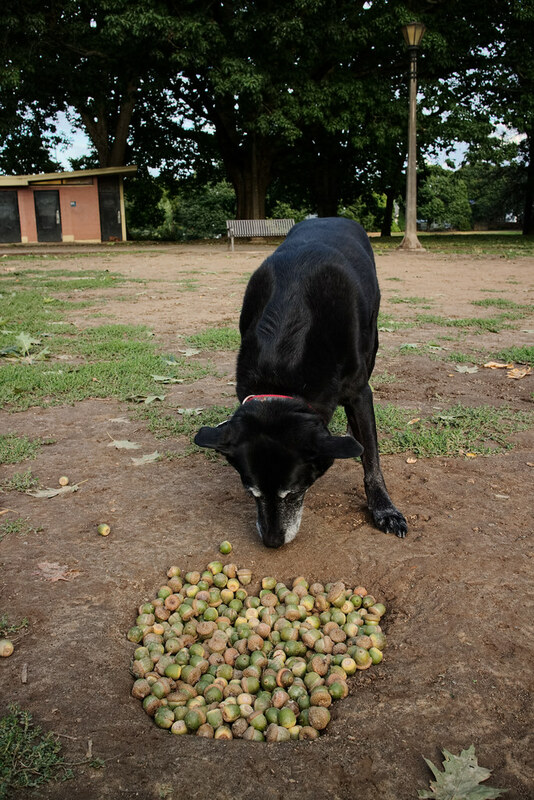 Still, she wants to sniff each acorn just to be sure, hope springs eternal when it comes to food with this dog. This morning a storm knocked a bunch of green acorns to the ground and some kids collected them and stuffed them into the largest hole the dogs had dug in the dog park. 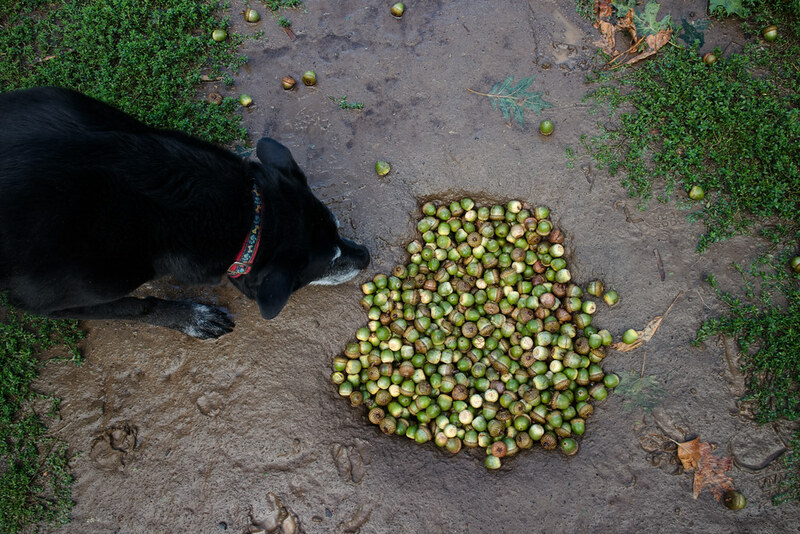 Ellie of course had to sniff them, although not for long, the green acorns didn’t hold the appeal of the ripened ones. In the picture below, Ellie again “sniffs” the acorns. I put sniffs in quotes because this was our evening walk and the morning’s sniff had already revealed there was no food to be had, so she wasn’t interested in further inspection. I wanted a different vantage point than the morning picture however so I bribed her by placing one of her treats beside the acorns. We must have been in a vortex that swallowed sound, however, as several times she seemed not to hear me when I gave the “leave it” command and instead ate the treat as soon as I set it down. Not the most productive weekend I’ve ever had, spent much of it with at least one of the cats (and sometimes all three) curled up on me. Sometimes I may have joined them in a nap. Saturday I spent much of the day in our air-conditioned room as the high winds and occasional rain made it hard to keep the windows open and the house was still pretty hot from the past heat wave. 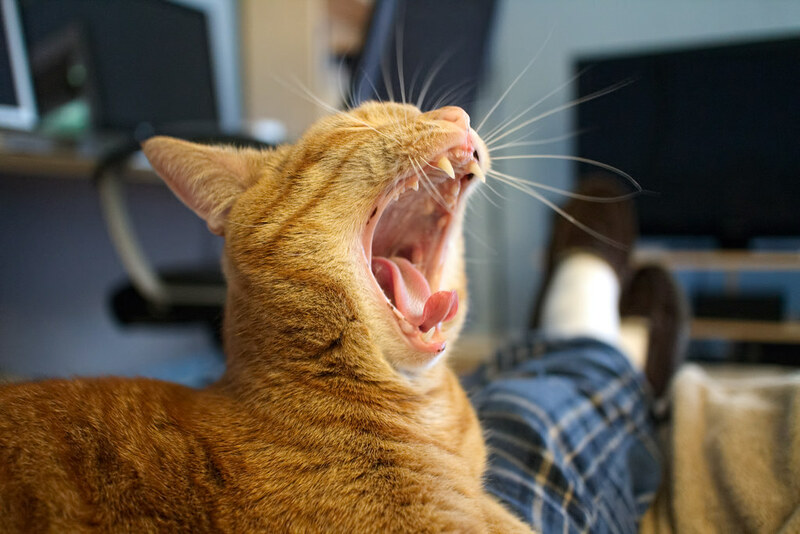 Today brought more (much needed) rain but less wind so we could keep most of the windows open, but the wind had stirred something up that upset my sinuses as I was a bit loopy and woozy today. This picture of a sleepy Sam in my lap is from this afternoon, but he’s in the exact same spot as I write this late at night. I held the camera down at his eye level and over to the side so my legs and feet would be visible, emphasizing that he was curled up in my lap. The ability to move the camera away from my eye is my favorite thing about mirrorless cameras, I do it constantly for my pet pictures. It’s not a stable way to hold the camera though, which is why I’ve been thinking of switching to a camera system that builds stabilization into the camera. 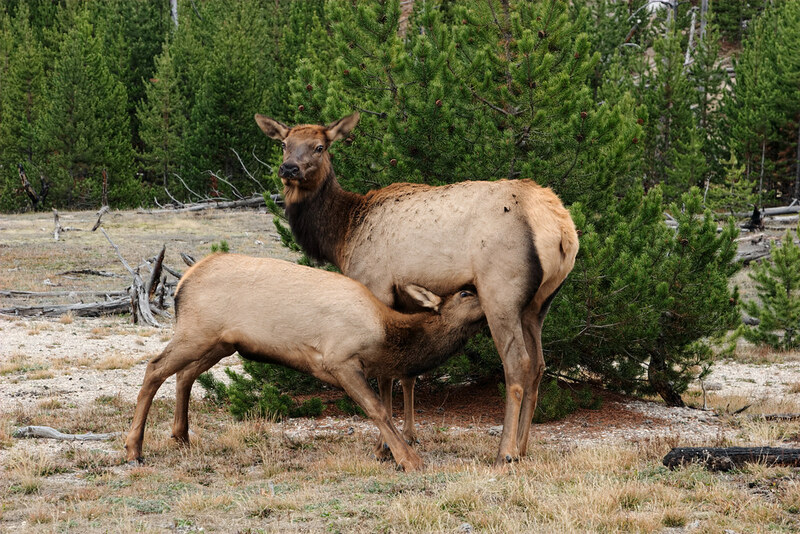 I was walking up to see the geothermal features in the Artists’ Paintpots region of Yellowstone and was surprised to see this elk and her calf near the trail. The calf started nursing and the mother, despite looking at me in this picture, was rather non-plussed by my presence. No one else was around so it was just a quiet little shared moment between the three of us. We finally got some much needed rain and I wanted to take a picture to celebrate it, but we also got high winds so I couldn’t take any macro pictures like last time. 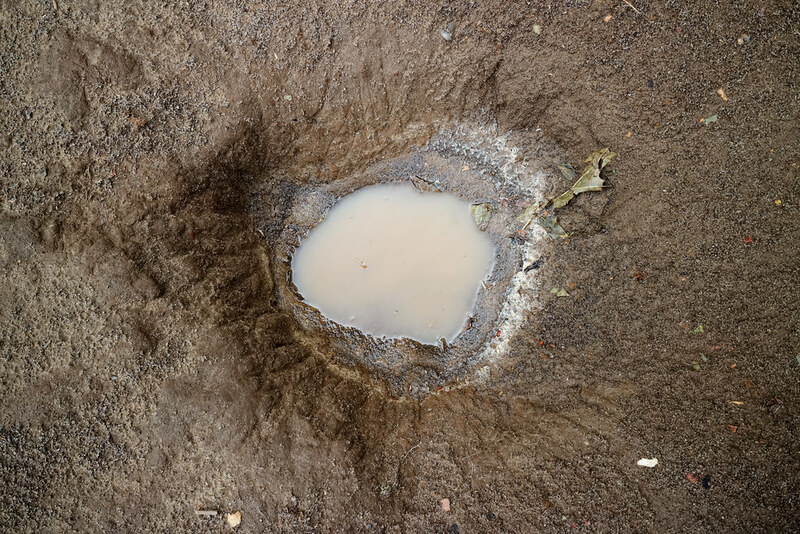 But when I took Ellie up to the dog park I saw this hole that had started to fill with water and it reminded me of another hole in the earth I like photographing, one from Yellowstone National Park (shown below). 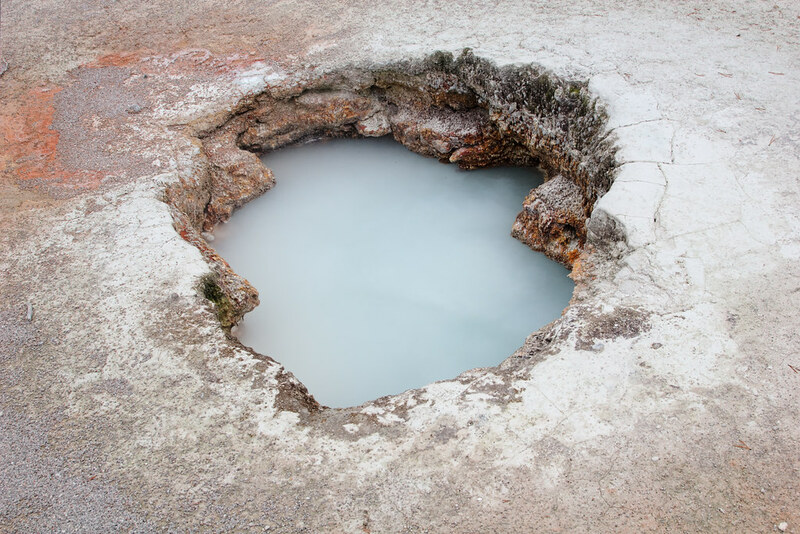 That one is one of the many geothermal features in the area and is filled with water from below, not above. There are a few of these holes in the dog park, and since Ellie likes to run beside me in the park, I have to navigate around the holes so that neither one of us steps in one and twists an ankle (she watches me more than the way ahead, trusting me not to lead her astray). The parks folks fill them in occasionally but some dogs like to dig, so new holes always appear. They’ve been spreading sand at this end of the park the past few years and it’s a big help during the winter when rain is not hard to come by, as the sand drains well and it gives Ellie and I a safe area to run in. In the old days she’d still want to run out into the grass, but only one of us has a body built for running in such muddy circumstances, and these days even she isn’t quite as steady on her feet as age begins to take its toll. I never imagined the dog park would remind me of my beloved Yellowstone so today’s visit made me smile almost as much as the goofball dog who waited patiently for me to take the picture, and of course expected a treat as her reward. 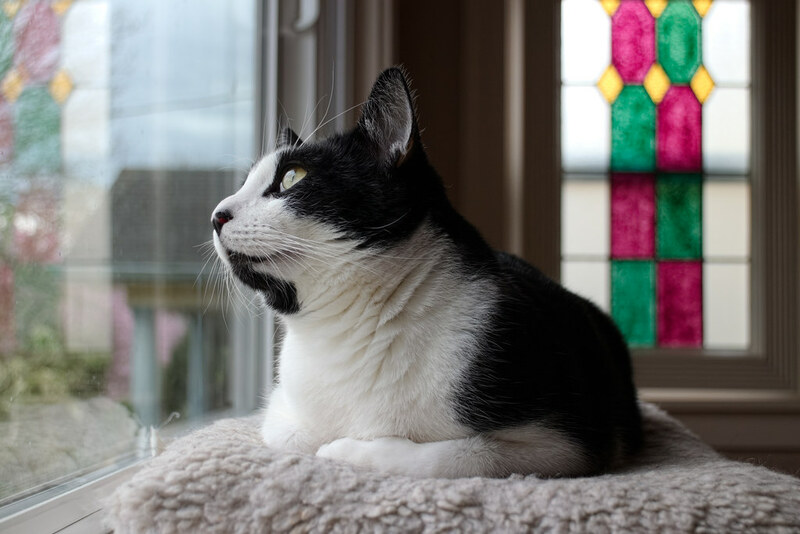 I loved Boo’s angelic look as he watched birds outside our picture window, with stained glass windows hanging behind him. I believe the windows may be homemade, they were there when we bought the house, I like the flair they add to the room. An unusually hot and dry summer in the Pacific Northwest has led to many troublesome wildfires, and the winds shifted this weekend bringing smoke from fires far to the east into Portland. We kept the windows closed to minimize the smoke coming into the house, and spent the entire weekend in our bedroom with the portable air conditioner keeping things nice and cool. 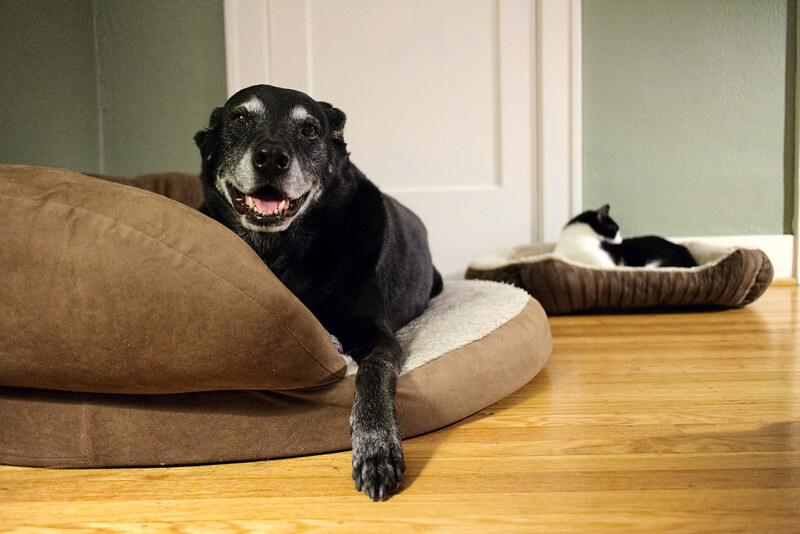 I took a quick picture of Ellie in her dog bed and Boo behind her in the cat bed, Sam was with my wife on the bed and Trixie I think was playing elsewhere in the house. We keep the bedroom door mostly closed to keep the cool air in, but open enough that the cats can come and go as they please. When Ellie walks in she swings the door wide open with a dramatic swoop of her head. It makes me laugh every time, our sweet-natured goofball making such a grand entrance.